VALVE ACTUATOR & ACCESSORIES VALVES VARIABLE SPEED DRIVES VENTILATION SYSTEM & EQUIPMENT LIKE FANS DAMPERS, AHUS ETC. Please Upload all documents against it after logged in. Note - Special Category State :- Arunachal Pradesh,Assam,Jammu & Kashmir,Manipur,Meghalaya,Mizoram,Nagaland,Sikkim,Tripura,Himachal Pradesh and Uttarakhand. Prefix:* Select Mrs. Mr. Ms.
1. The Portal enrollment shall not bind NPCIL to give any priority or preference in the issue of Tenders and Placement of purchase orders. at the sole discretion of NPCIL. 3. The performance shall be periodically reviewed by NPCIL for continuation of the enrollment with NPCIL. 4. If the performance is found unsatisfactory, NPCIL reserves the right to cancel the enrollment of the firm. requirements of the items for which the firm is registered. 6. If there is any change in the details like name, location of works/sales office, Management / organization structure, validity of certificates, etc. the same shall be intimated to NPCIL promptly along with relevant documents for correction/ done using the updation facility. 7. The documents submitted during portal enrollment shall be revalidated before the expiry of the same. 8. The firm shall take necessary action to get the timely validity extension of the digital certificate. (CA) operating under the Root Certifying Authority of India (RCAI), Controller of Certifying Authorities (CCA) of India. 10. Vendors are requested to upload scanned copies of all Documentary Evidence/Registration Certificate as above. 11. 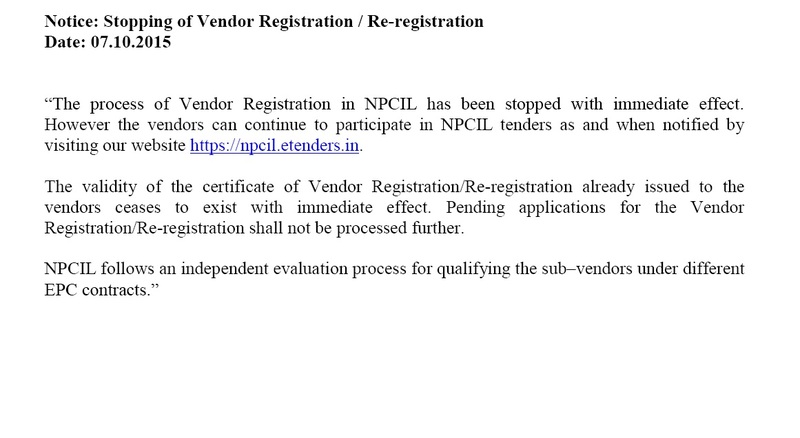 At present there are no charges for enrollment/Support/training for NPCIL etendering portal. 12. Incomplete application will be rejected by the system.